Pursuing the hand-made art & jewelry industry! The New Year is here!! I have been taking a break from craft shows and working on updating my etsy shop. If you love simple, natural, nature-inspired jewelry…these little leaves have been added to my etsy shop, Sunshine On Water! Don’t miss these, they are one of a kind and perfect for everyday wear! This entry was posted in Uncategorized and tagged crafty, etsy shop, handmade jewelry, leaf earrings, New Year, sterling silver, Sunshine On Water jewelry. 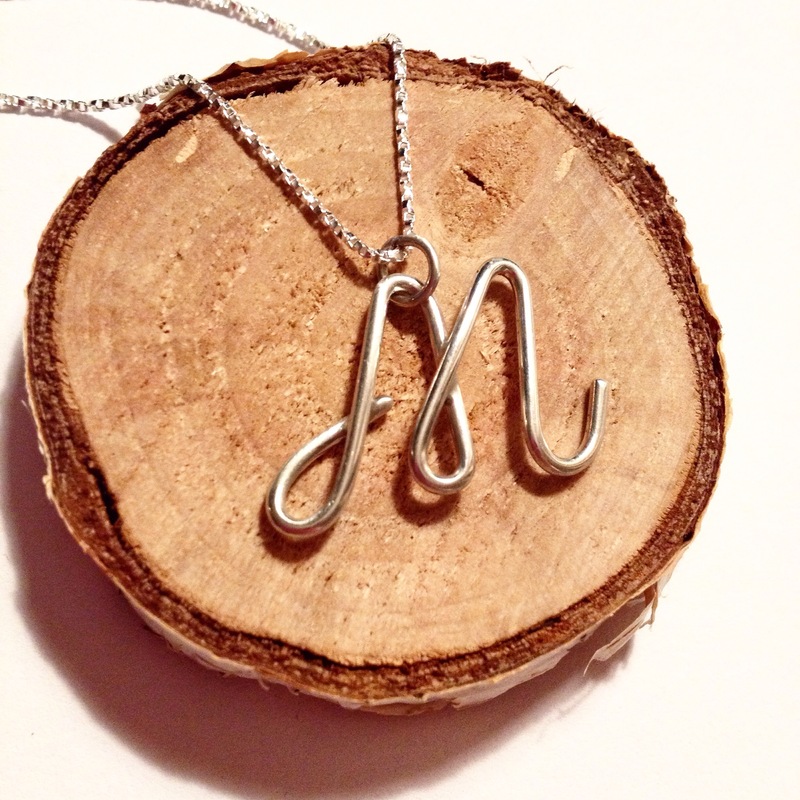 Here is a little sterling silver letter m necklace I made recently. This one was shipped to a new home in northeast Canada last week! 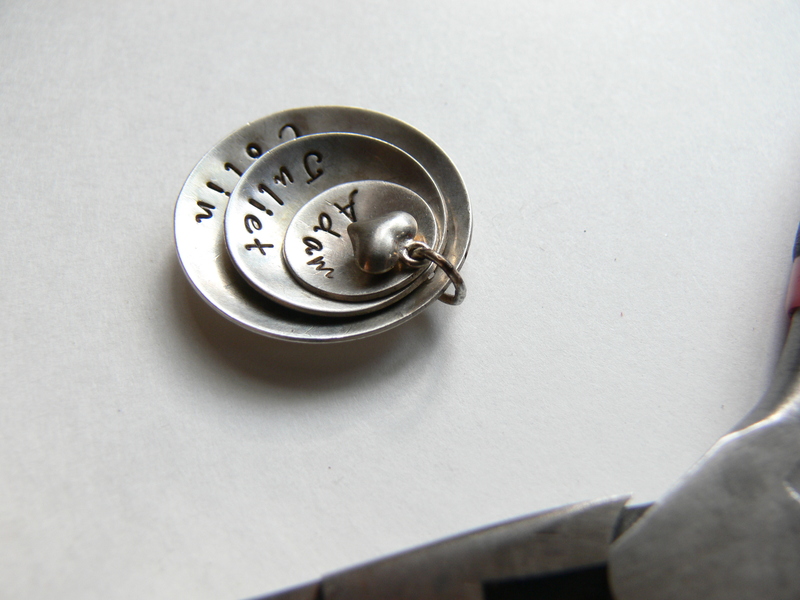 Each letter is hand formed with .925 sterling silver and when finished, goes on a sterling silver necklace chain. You can find more little letters on my etsy shop, Sunshine On Water! This entry was posted in Uncategorized and tagged etsy, handmade jewelry, initial necklace, initiall pendant, jewelry, metalsmith, moms, NY, sterling silver, Sunshine on Water. 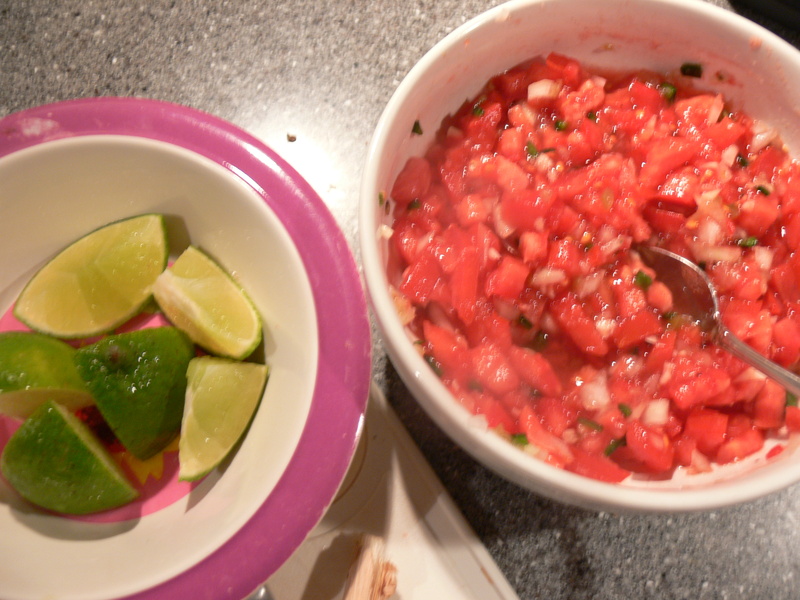 1 or 2 Fresh tomatoes chopped into small pieces, red or sweet onion chopped, a few cloves of garlic finely chopped, black pepper, a few squeezes of fresh lime juice, a pinch of salt and cilantro for garnish. Mix it together, let it sit briefly to absorb flavors and serve with tortilla chips! It’s easy and so good you’ll want to make more the next day! Along with outdoor activities and farm markets to visit, I have been getting ready for upcoming art and craft shows in Upstate NY. I recently ordered new sterling silver from Thunderbird Supply since the price of silver has gone down quite drastically the past few weeks. As of today, Monday, the price has gone up to 17.32 US dollars per troy ounce. It’s time to get to working on new jewelry designs! You can see new necklaces on my etsy shop, Sunshine On Water…all are hand-formed and come with a sterling silver chain! This entry was posted in Uncategorized and tagged fall, food, jewelry designer, salsa recipe, silver prices, sterling silver, Sunshine On Water jewelry, Upstate New York. 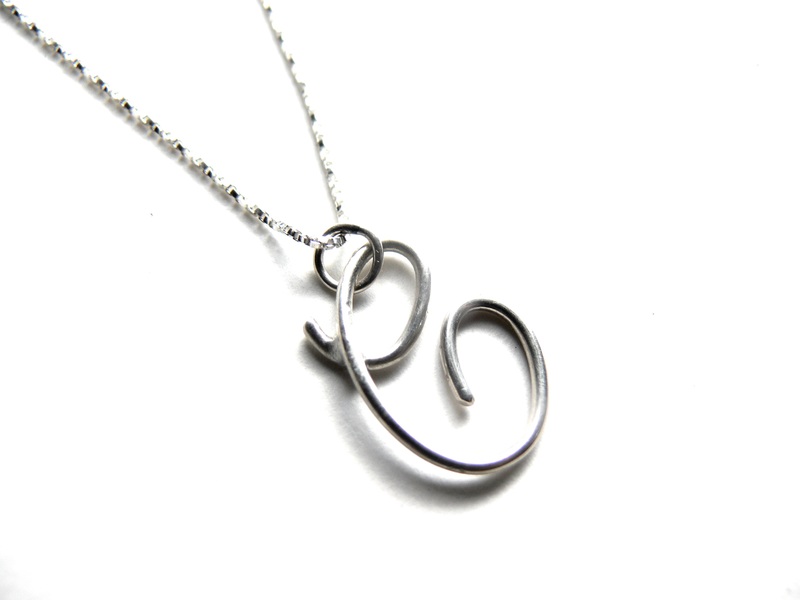 This entry was posted in Uncategorized and tagged cursive, initial necklace, jewelry, sterling silver, Sunshine on Water. Fashion and accessory fads tend to lean toward big, chunky jewelry but if you’re looking for the perfect pair of earrings (to wear everyday), check these out!! I work hard to make jewelry that you can wear on a daily basis, feel comfortable in and enjoy!! Sunshine On Water jewelry is hand-crafted in Upstate New York by Betsy Murray. This entry was posted in Uncategorized and tagged Betsy Murray, fashion, handmade jewelry, jewelry designer, sterling silver, Sunshine on Water. Here are some new Sunshine On Water earrings I’ve been making using sterling silver and beach glass! The beach glass I use is from Lake Erie, it’s lovely! Many people ask me if I drill the holes, I do not. I have tried drilling shell with my dremel tool but basically I ended up breaking it and not being able to drill clear through. Ok, it was total mess! I know a few artists who collect beach glass, they do the drilling then ship to me. Drilling glass or shell is really difficult and since metalsmithing is my forte, I’ll leave the drilling up to someone else who knows exactly what to to do it! Part of the work involves drilling without cracking the glass or shell which takes time and good tools! These earrings incorporate round rings with opaque beach glass! I formed the round rings, then hammered them lightly. I also made the jump rings then silver soldered both the round rings and jump rings. After cleaning and polishing, I made and added on the the earring hooks. ALL of the metalwork was made my me- yes, 100% hand-formed metalwork. These lovely earrings are great for summer days! You can find them on etsy.com, my shop is Sunshine On Water! This entry was posted in Uncategorized and tagged beach glass, etsy shop, Hand-made jewelry, sterling silver, Sunshine on Water. 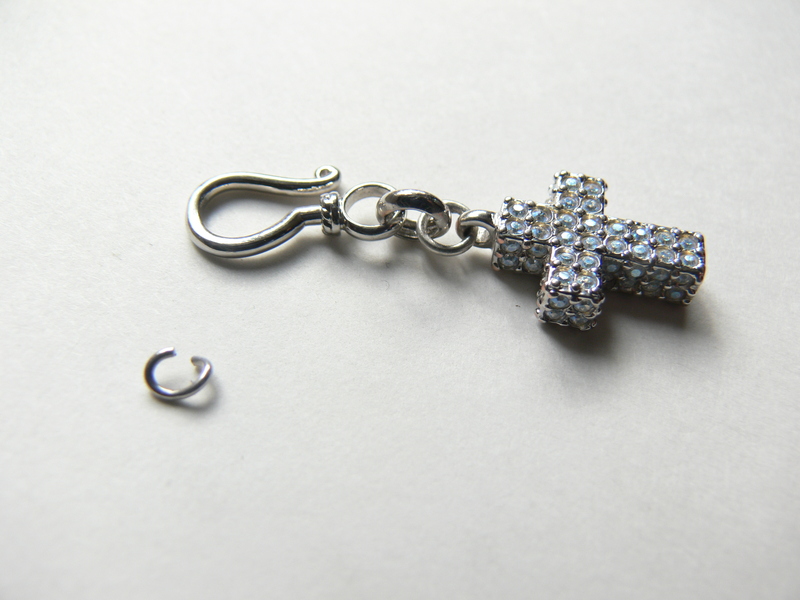 People often forget that I can fix jewelry as well as make jewelry! I generally don’t but if you have a special piece of jewelry that you can’t wear anymore because it’s broken or the jump ring has pulled off let me know! I make all my own jump rings with sterling silver and silver solder them closed so they won’t come open if pulled by little hands. I have kids, I know what it’s like when they get their adorable little fingers on your necklace or earrings… they like to touch! A few years ago, I bought a new pair of glasses. I really liked them and my daughter, who was around 1 or 2 years old, wanted to help put them on me one day…the short story, she completely pulled them apart stretching them out beyond repair! Ahhh!! I remember calling my eye doctors office, explaining what happened, only to be assured that I had ONE month left before my 1 year warranty was up! Whew, thank goodness! This entry was posted in Uncategorized and tagged handmade jewelry, initial necklace, jewelry for moms, kids, sterling silver, Sunshine on Water.